OPEN Registration for ALL ESL Classes on March 4th, 5th, 6th & 7th at 9AM to 10AM AND on Tuesday, March 5th, Wednesday, March 6th in the evening from 4PM to 5PM. 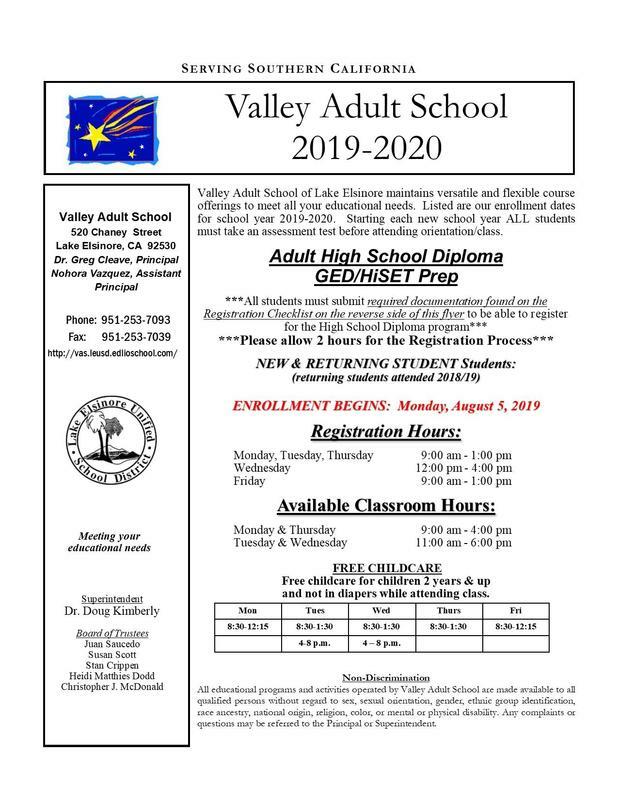 Valley Adult School now offers College Credited "CHILD DEVELOPMENT CLASS!" We have limited space! We are taking enrollment for students who are interested in obtaining college credit for Child Development Program. See the Child Development flyer under "Programs/Vocational Education" for detailed information. VALLEY ADULT SCHOOL enrolls every week for our High School Diploma & GED Prep programs. Please See the "Registration" tab on our home page. Location: Lake Elsinore Storm Stadium (The Diamond).